Old Fashioned Baked Beans: Slow cooked pinto or navy beans with a homemade sweet and smokey sauce. 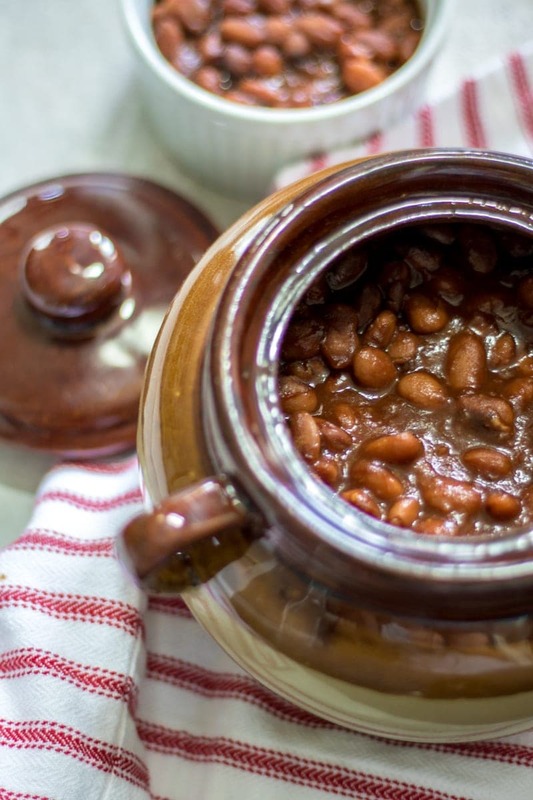 A family heirloom recipe for the best baked beans that you have ever tasted–no cans here! Don’t you just love that bean crock? I have had my eye on my Papa’s bean crock for my ENTIRE LIFE! My mom still claims ownership of it but I lucked out with this beauty from an antique store. I like to pretend it is one that was passed from generation to generation, just like the one in my family. Regardless, it gets it use in my household for my Papa’s Baked Beans. This is one my family’s favorite recipes of all time. Along with Italian Pasta Salad, Blueberry Pie Bars and Cucumber Salad, it is at every family BBQ and summer get together–we just don’t settle for ANY other baked beans out there. And once you have these beans, you will NEVER settle for any beans ever again! Let me start by telling you that my Papa was a man of simplicity. He took a short cut and started with 3 cans of condensed pork and beans and then gave it his magic, which you can certainly do. HOWEVER, I am a woman that prefers real food and the cans of pork and beans can be loaded with unrecognizable things and corn by-products (which we avoid for my nephew who has a sensitivity). The day before I want to serve my beans, I soak the beans in cold water and let them sit overnight. In the morning, I drain any liquid that remains and cover them again with water and 1 tablespoon kosher salt and bring to a boil and then simmer for 1 hour. (This step is NOT necessary, but certainly makes the beans more tender than if I chose not to boil them and just soaked them.) Once the beans are cooked, into my bean crock they go and I add in all the magic ingredients. 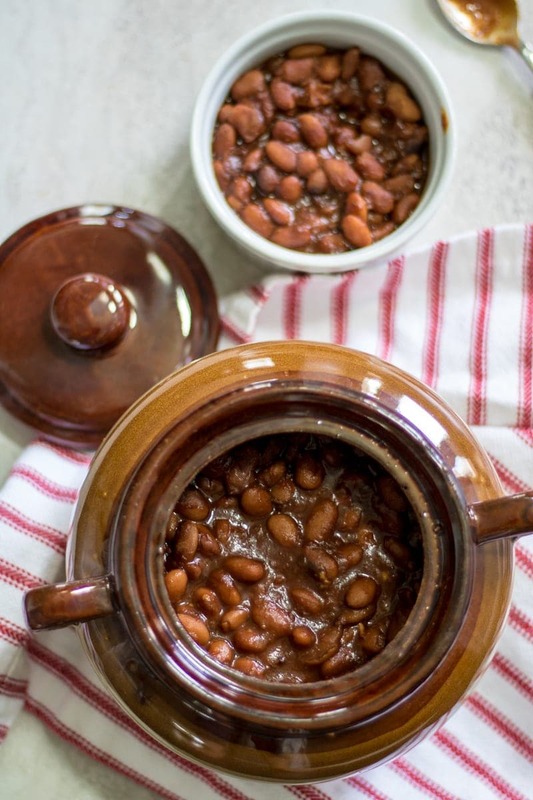 Note: You can also cook dried beans in 30 minutes using the Instant Pot–directions here. 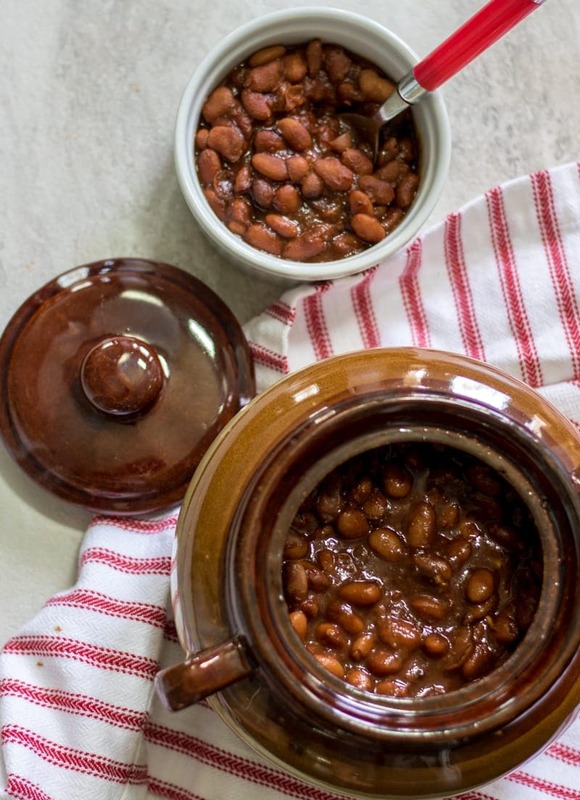 So get out your bean crock (or oven proof dish) and be ready to WOW everyone with the best maple baked beans they ever had. Oh, one more thing…one more VERY important thing: You must not serve maple baked beans with utensils, they are to be eaten with plain potato chips (preferably from a yellow bag). I know that sounds horrible, but trust me when you eat THESE beans with potato chips, you may skip the burgers, the sides, and ALL the desserts (at least at times I do). A homemade version of old fashioned maple baked beans. Cover beans with water and kosher salt. Bring to a boil, and reduce to a simmer. Simmer for 1 hour. Place beans, remaining ingredients, and and additional 1 cup water, into bean crock or oven safe dish and stir well. Bake covered for 2 hours. Uncover and bake for another 30-40 minutes, until thickened. *Alternatively, you can make these in the slow cooker. Cook all ingredients on low for 10-12 hours (after simmering the beans). Tiffani, nothing wrong with canned beans now and then, but once you make these, you will never buy another canned bean again–and it is almost as easy as opening up a few cans! Baked beans are a summer staple! I always make my homemade since I need them vegan and GF! Bonus is that homemade tastes so much better! This is one of the very few side dishes I’ve never made homemade but have always wanted to. My favorite summer meal is a good grilled burger, potato salad and baked beans. I’m bookmarking this one Kristen! You know what Ally–let’s get together. It sounds like between the 2 of us, we would have the PERFECT summer dinner! These sound delicious! I’ve never had home made before. Will try this! I hope you LOVE them Stacey! It isn’t summer without baked beans! These look fantastic – love the addition of maple syrup. You better believe summer is NOT complete without baked beans!! I loooove baked beans and never considered making them homemade…this recipe looks and sounds great! Definitely a must try, thanks for sharing! You have to try these–so much better than anything you can buy! HA!! I LOVE LOVE my bean crock. Best of luck finding one! I love baked beans and have tried to make them before, but they didn’t turn out quite right. I may have to give your recipe a try. Well, I hope by recipe works. The key for me is soaking and boiling before baking. And then baking long and slow. I absolutely adore baked beans, and yours sound absolutely delicious!! This reminds me of home and growing up… i can still smell them. love the classic dishes… they are always a staple. Whoa! My parents have a bean crock that does not get enough use… I might have to negotiate ownership next time I visit! And… Homemade beans with potato chips from the yellow bag??!! Of course! This brings back so many camping memories. I love baked beans, sometimes with toast even. When I was a child, my grandmother used to make the best homemade baked beans. To this day, I still haven’t been able to make them as good as she did. This recipe looks great and I definitely need to try it! Hopefully this recipe will be close to your memory! There is nothing like the taste of old fashioned baked beans! I love everything about your recipe! I am trying them for our next cookout! Thanks Michelle. I hope they are a hit! So glad I found your recipe! Two of my daughters have food allergies, so we are REALLY careful about what they eat (plus we try to do mostly whole foods/less processed anyway). We are hosting a picnic in a couple of weeks for our youngest daughter’s Dedication at church and this recipe looks perfect! My daughters have never had baked beans before (since we’ve always avoided them in a can)… so I’m excited for them to try (sans bacon and potato chips) 😉 Thank you!! Dealing with food allergies can ve so hard!! I am so happy you found a recipe you can share with your family without worries. Enjoy! Hi Kristen, my wife loves her bean pot, (err crock) too! But we both love to cook/entertain, especially in the summer when I can run my smoker! and these beans look amazing! Anything with molasses and maple syrup in it has my vote! About how many servings do you get from this recipe? Oh my goodness–I want to come to your cook-outs. They sound amazing! This serves about 10. For a large cook-out, I would double and it should be plenty. And feel free to use canned pinto beans to speed up the process. Enjoy! You list onion and salt twice. I’m assuming the onion is an error, but wondering if I should do 1T + 1t salt? Oh dear!! I am updating recipe now. Only add 1 tablespoon salt! Can I used mustard instead of the powder? Hi Kristy, you can use just a teaspoon of regular mustard if you like or you can omit the dried mustard with no worries. Oh my gosh thank you for replying so fast! Will the taste be the same, have you tried both ways? If it’s better with the powdered kind I can go to the store. And now I am not replying quickly–sorry. I was busy working on new recipes. So yes, I have tried it both ways–I do prefer the powdered variety, but you will be okay either way. Sorry for the delay again! Enjoy. Hi! I’m goi g to try the recipe for a party on Saturday! I’m reading all reviews and it just sounds like everyone is going to try it but hasn’t made it yet. Can I please get feedback? Out of all recipes I find this one is my favorite because all others have way to many ingredients. I’m just worried that 3/4 cup of maple syrup is too much and also the molasses. Can someone please please pretty please provide feedback before I make it? Thank you so much! Worries about the party of Saturday…don’t want my beans to be an epic fail. These beans are SWEET–but like the good old fashioned beans you get at a bbq. My family and everyone I have served them to adores them. Hope that helps! Feel free to use canned beans as well. Thank you, I will be brave and make it😊 How much water though for three cups of beans (after beans are soaked?) Or do you not place the excess water after boiling them in the oven or crock pot? I don’t think you will be disappointed Kristy! So I would suggest draining your beans after soaking. Then I would cover all your beans with water in a large pot (as much water as it takes) and a couple teaspoons salt. Boil until super tender. Drain and then mix with remaining ingredients. 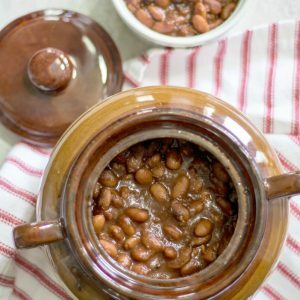 I have tried this recipe twice now and followed the directions exactly both times (soaked overnight and simmered before baking) and while the flavor is good, the beans are still crunchy. Any suggestions? I am so sorry you have had issues Amanda. We have never had the problem. Be sure you cover the beans fully in water and that you are draining your soaking liquid before simmering beans. Also be sure you bring the beans to a full boil before lowering to a simmer. You may also want to simmer for an extra 30 minutes if you like your beans really tender. Hope that helps! II noticed at the introduction for the recipe it says pinto beans and in the recipe it says navy bean. Does it matter which one uses? Great catch Michael. Navy beans are traditional for baked beans, but pinto beans work GREAT as well! I love this recipe both ways. I made these last night for my extended family who only eats canned beans. I was worried they would not approve of the “homemade” texture or flavor. Boy was I wrong. These were delicious and everyone wanted the recipe. I did a few things different than the written recipe but only bc I needed to leave during the hour of simmering. So I simmered on the stove for about 30 minutes then put in my instant pot with the the sow cool lid on and set on slow cook for about 2 hours while I was gone. Then came home and added everything but the extra water and used the pressure cook lid and bean setting and cooked them and then left on keep warm for several hours. I did transfer to a glass baking dish in the oven after to reduce the liquid. Sounds labor intensive as I type it out but it’s actually not at all. Will def be making these often!! YAY!!! I am so so glad your family loved this recipe. And I love how you modified it to suit your timing needs. Made these today on the coldest winter day so far. They are incredible. I soaked the beans overnight and cooked them 20 minutes in my instant pot. A moment’s distraction caused me to forget the onions so I caramelized them in a skillet and added them in for the last hour of cooking. Scrumptious! I am so glad you enjoyed Marcia! And stay warm!! !